This page will guide you to create backup of an installation on remote server(i.e you can take backup of your installation on other server). Note : Backup on Remote Location feature have been added since Softaculous version 4.8.9. 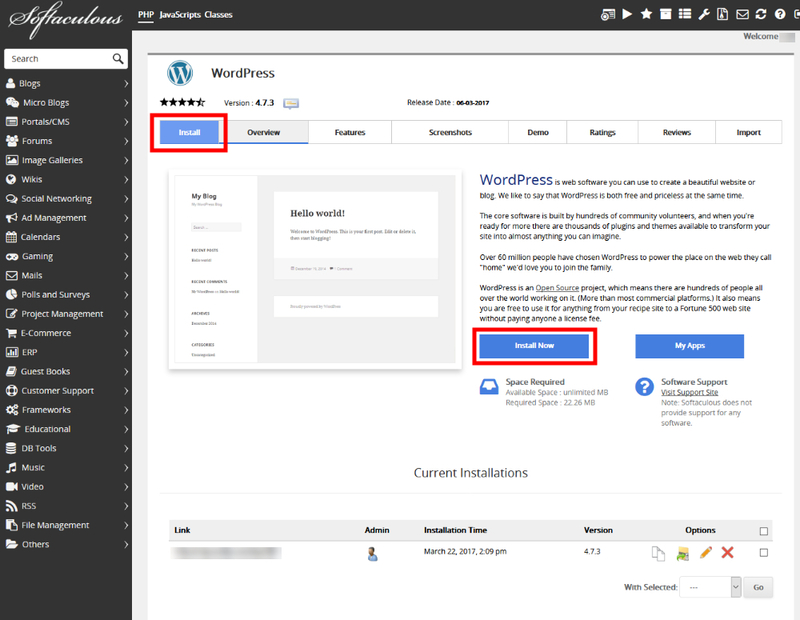 The following guide will show you how to add, edit, delete, set a backup location for new as well as existing installations. 1) Go to Softaculous Enduser -> Edit Settings -> Click on Add Backup Location. 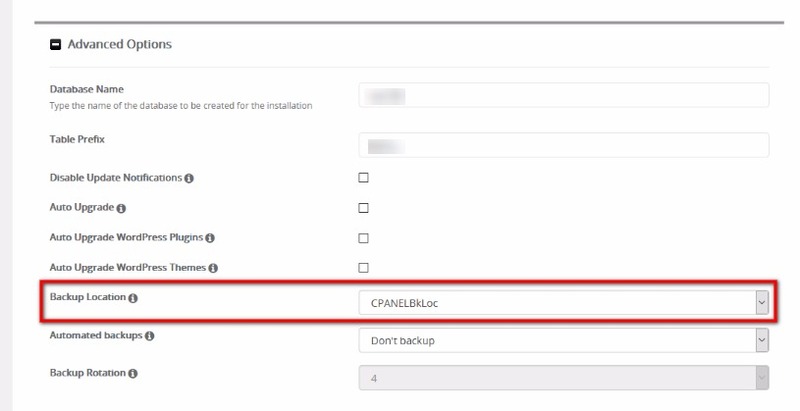 2) Fill in the details of the remote backup server and then click Add Backup Location to save the details. Location Name : Choose a name for the Backup Location for your reference. Server Host : Enter the server host (e.g. ftp.mydomain.com) where you want to store your backups. Protocol : Select the protocol by which Softaculous will communicate with the remote server. Default is ‘FTP’. Port : Enter the Port to connect. Default FTP port is 21. FTP Username : The username of your FTP Account. FTP Password : The Password of your FTP account. Backup Location : Relative path from FTP user’s directory where you want to store your backups e.g. /backups. 1) Go to Softaculous Enduser -> Edit Settings -> Click on Edit icon provided besides the location in the list. 2) Edit the details you want to change and then click Edit Backup Location to save the details. Go to Softaculous Enduser -> Edit Settings -> Click on Delete icon provided besides the location in the list. Once the backup location is deleted the installation(s) for which the backup location was assigned will be reassigned with Default Backup Location selected. 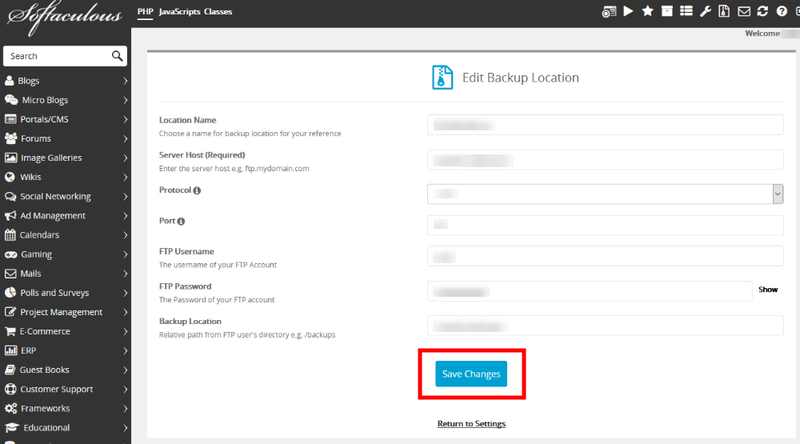 If the default Backup Location is deleted as well, the backups will be stored by default on the Local Server. 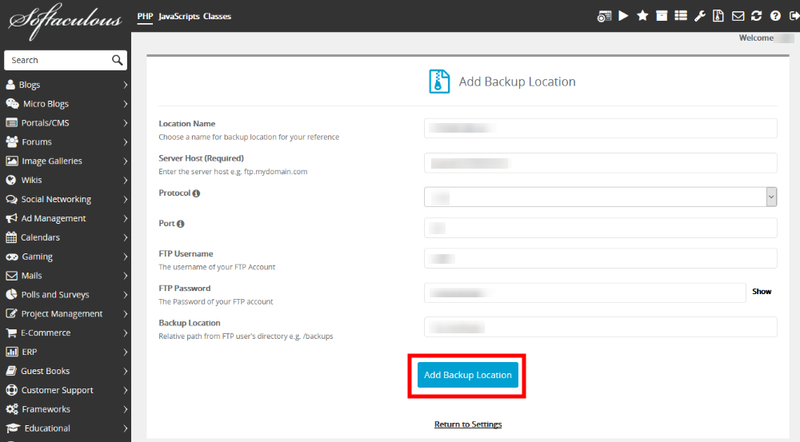 You can also set the Default Backup Location from User Settings page. Go to Softaculous Enduser -> Edit Settings -> Select the Backup Location you want to set as Default Backup Location (click on the Radio Button) -> Save the settings by clicking ‘Edit Settings’. Significance of setting a Default Backup Location is that even if no backup location is set for an installation, the backups will be stored at this default backup location. You can assign the desired backup location during installation of the script. 1) Go to Softaculous Enduser -> Select any script you want to install -> Click on the Install Tab. 2) Install form will be displayed. To select Backup Location go to Advanced Options section of the install form. 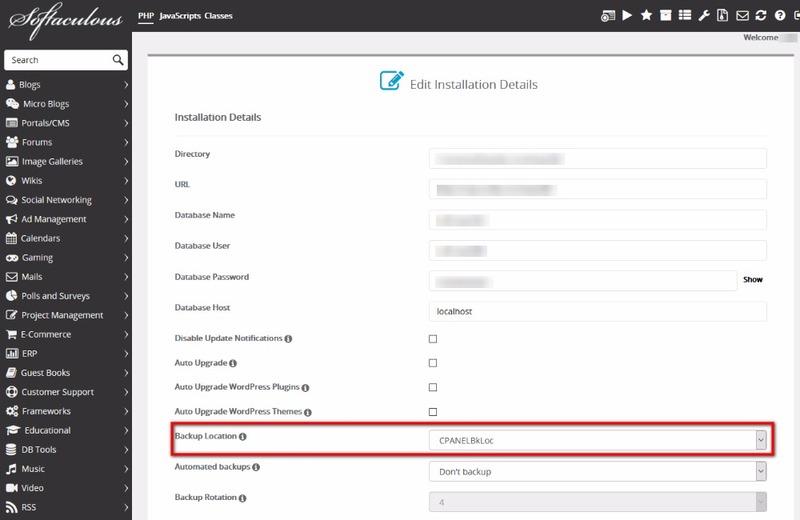 Select the backup location where you want to store the backup of your installation. Once you are done with the details click on install button. Now you can take a backup of this installation from Create Backup page. Your backups will be stored at the Backup Location you have set. You can set Backup Location for an existing installation(s) as well. 1) Click on Edit icon. 2) After clicking on the Edit Icon you will be redirected to the page where you can edit the installation. 3) Edit the Backup Location by selecting the one you want from the drop down. 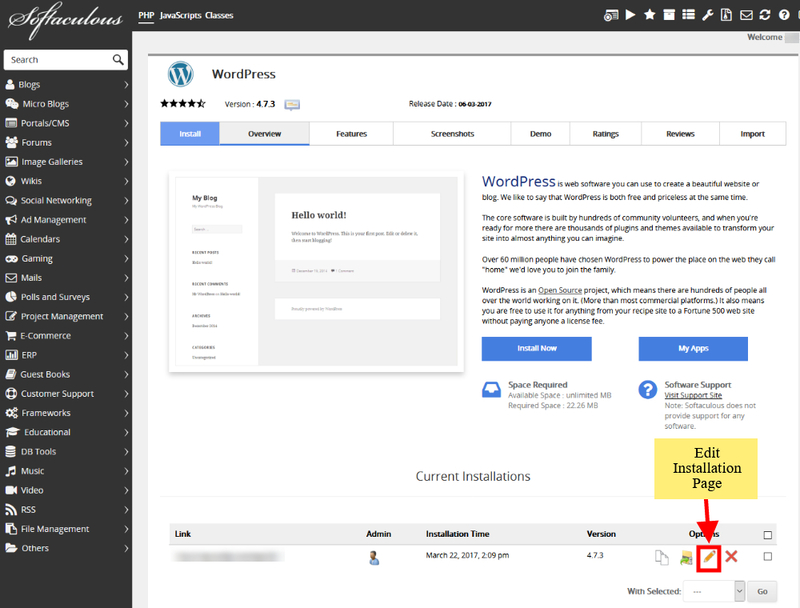 4) Now click on the Edit Installation button to edit the installation details. Now the backup of this installation will be stored at the Backup Location selected.